Ad Hoc Hen And Chicken Chardonnay Pemberton, Larry Cherubino - Aromas of melon, citrus and minerals, follow through on the palate. Ad Hoc Wallflower Riesling Mt Barker, Larry Cherubino - Intense lemon and lime with white spice and underlying wet stone nuances. The wine is softly textured with citrus flavours following through onto the palate. Allegory Riesling - Delicate aromas of honeysuckle, musk and citrus blossom lead to a bold, dry palate full of pear, lime and grapefruit. The finish is long and mineral. Allegory Sauvignon Blanc Semillon - An enticing aroma of guava, gooseberry, fig and melon leads to a tropical palate lifted by herbs and citrus. There is great freshness and balance all the way through to the crisp finish. Alpha Box & Dice Golden Mullet Fury Semillon Viognier - An award winning blend of Semillon and Viognier from the McLaren Vale, South Australia. Apostrophe Stone's Throw Larry Cherubino - Riesling's cool minerality meshes with Gewürztraminer's exotic spice and rose water, in this delicious, refreshing blend. Berton Vineyard Winemakers Reserve Chardonnay - A fresh, cool-climate Chardonnay which pulls together quenching tropical and citrus fruit flavours with delicate French oak. Berton Vineyard, Winemakers Reserve Fiano - A lovely example of the Fiano grape, with its lifted floral bouquet, exotic tropical notes of lychee, pineapple and subtle herbaceous aromas. Berton Vineyard Winemakers Reserve Vermentino - Quintessential Vermentino with delicate citrus and pear leading to a palate which is bursting with tropical fruit, lychee and kiwi fruits. Berton Vineyard Winemakers Reserve White Viognier - This alluring Viognier displays lifted aromas of nectarine and peach, complemented by floral nuances of jasmine and orange blossom. Berton Vineyards Foundstone Pinot Grigio - This Pinot Grigio displays subtle aromas of apple, pear and citrus. Berton Vineyards Foundstone Unoaked Chardonnay - This unoaked Chardonnay is an appealing fruit driven wine that has aromas of candied lemon, lime and honey dew melon. Berton Vineyards Reserve Chardonnay - This Reserve Chardonnay has generous aromas of white peach, beautifully balanced by spicy oak with toasty undertones of vanilla and mocha. Best's Great Western Riesling - Fresh flowers, lime and citrus notes with a great intensity. 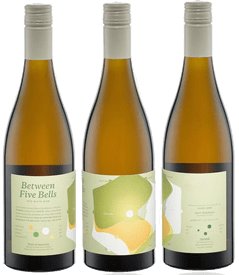 Between Five Bells White This wine is a blend of Pinot Gris, Riesling, Chardonnay and Gewurztraminer. Boundary Line Chardonnay - Aromas of citrus and melon. The palate is soft with a cleansing acid finish. Broken Shackle Classic White - The palate is wonderfully vibrant and generous showing tangy passionfruit, juicy citrus fruit and supple honeydew melon that lead to a clean fresh finish. Bush Telegraph Pinot Grigio - This wine displays aromas and flavours of pear and green apples, with a pale straw yellow colour in the glass. The palate is crisp and fresh with lemony acidity and bright fruit characteristics. Chapel Hill Verdelho - Rarely seen elsewhere, Verdelho was one of the first white varieties to be imported into Australia, in 1825. Chateau Tanunda Newcastle Marsanne Viognier Rousanne - Full bodied, bold Barossa fruit in a classic Southern Rhone blend. Intense fruit that doesn’t pull any punches.